Imagine your day enveloped by beautifully designed living spaces, restful sanctuaries and inspiring communal zones. While staying in cosmopolitan Shanghai, it is possible to enjoy familiar comforts and amenities while you pursue your biggest dreams. The Artyzen Habitat Hongqiao Shanghai is an 18,000 sqm construction that boasts 188 uniquely designed and decorated keys. 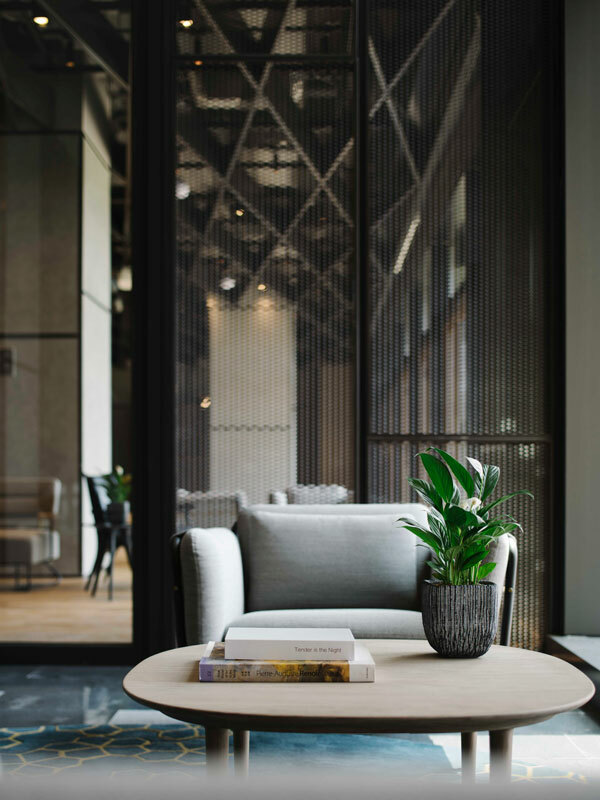 Completed in October of 2018 with Design Development, FFE Design and PM services from our dedicated SL+A Shanghai team, the focus is centred on a holistic approach that combines work, play, rest, discovery and community. Artyzen Habitat is a unique hospitality brand that reflects the values important to a new wave of dynamic and savvy modern travellers. People who are constantly on-the-go and always connected; those who believe in individuality, freedom, exploration and interaction. The very first steps onto the property transports visitors into a realm of discovery with a distinctively different energy and vibe – a feeling of infinite possibility that comes from the passionate who strive for great success. 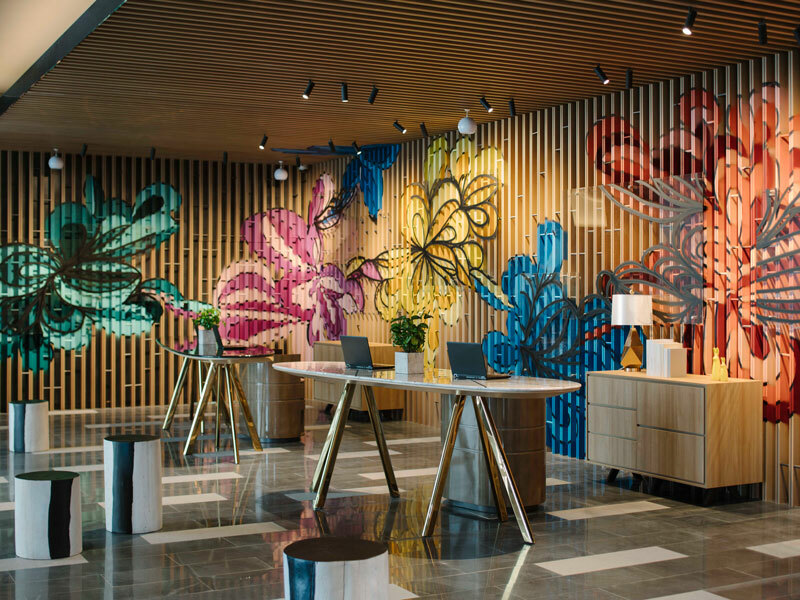 The layout and design of the hotel lobby is a delightful twist on the traditional format, transforming communal spaces into a ‘Townsquare’ for variety of creative uses by entrepreneurially-minded nomads. Modern art pieces adorn the walls and playful splashes of colour surprise visitors as they explore the different facets of the building. Angular lines are complemented by the curved motifs found in the furniture and decorative pieces handpicked to add interest to both public and private spaces. 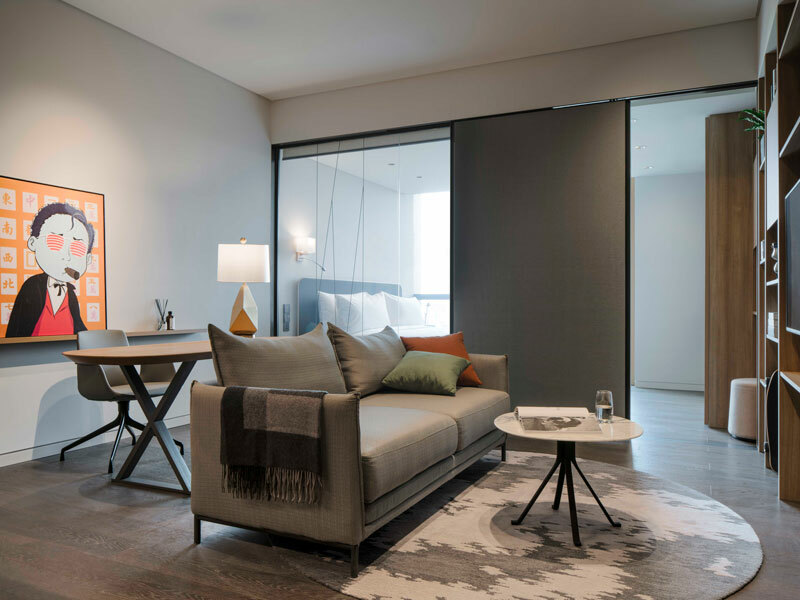 Stunning modern contemporary design principles mixes matte metals with varnished wood and the large windows allow natural light to filter into living spaces so you can always feel connected to the pulse of Shanghai. Facilities equipped with high-speed connection, contemporary décor and productivity hubs support the seamless integration of work and life for busy go-getters. The creative ecosystem is made possible with modern amenities and an incredible view of the city. 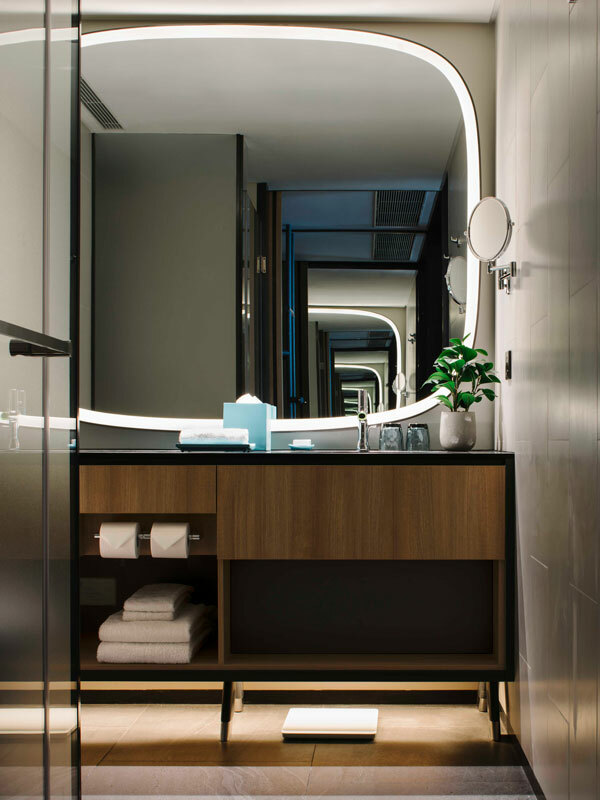 To further demonstrate the lifestyle philosophy, the rooms at Artyzen Habitat Hongqiao are modelled as a home away from home, featuring a spacious living space and a separate area for resting and sleeping. A fully equipped gym for workouts and the 24/7 self-service laundromat meet the needs of the urbanites, corporate warriors and mobile entrepreneurs who have to balance the rigors of work with a full and exciting personal life. 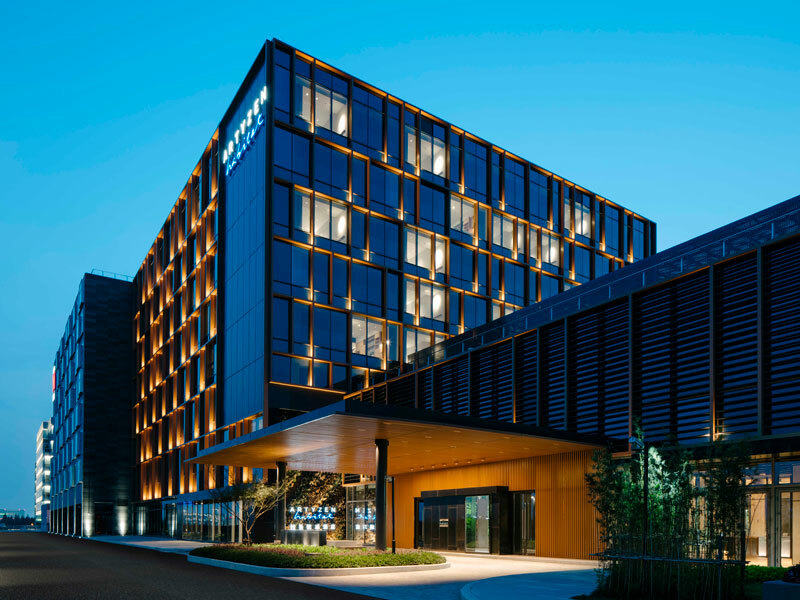 As a vital part of the commercial and retail environment in Shanghai, Artyzen Habitat Hongqiao allows guests to enjoy a wide range of dining and entertainment options. A mixture of popular local brands with strong street credibility provide an authentic look into the social scene and invites residents and travellers alike to mingle and uncover the art, culture and history of this historical city. Cross-cultural interactions between travelling guests and locals are encouraged through events and co-working spaces in the Townsquare specifically geared towards collaboration. To enrich the visitor experience, additional layers of activity and excitement can be added through the introduction of pop-up shops and short term exhibits that utilize the vibrant social spaces of Artyzen Habitat Hongqiao.